If you’ve searched on Google for the term “penny stocks” or been around the world of penny stocks for a while, then chances are you have come across Timothy Sykes. Sykes is known for turning his $12,415 in Bar Mitzvah gift money into over $1 million in a couple years as a college student by trading mainly penny stocks. So, is Timothy Sykes a scam? Is he legit? Well, first off I’ll say he is not a scam and yes, he is legit. In this Timothy Sykes review, I’m going to go over his trading strategy, subscription plans and DVDs to help you get a better understanding if it is for you. Before I get into the review of Tim Sykes, here is a little background on Sykes. Sykes turned $12,415 that he got for his Bar Mitzvah, and turned it into $1.65 million in a couple years as a college student by trading mainly penny stocks. After success with this strategy, he started his own hedge fund in 2003, running it for a few years. 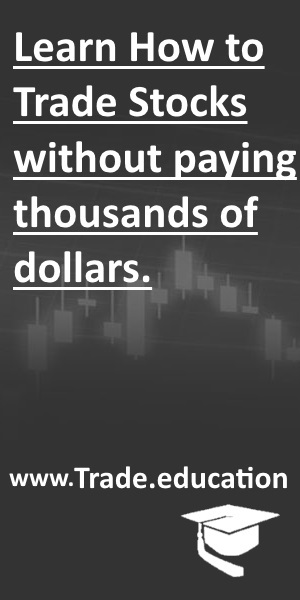 In 2007, he started his website TimothySykes.com which exposes many of the frauds in the world of penny stocks and a place where students can learn how to trade stocks. Tim Sykes main trading style is short selling penny stocks. For those not familiar with short selling, it is basically the opposite of going long a stock. When you go long a stock, it means that you buy a stock believing its price will rise. Conversely, when you go short a stock, you are anticipating a decrease in the share price. Short selling basically allows you to profit from the decline of a stock. For an expanded definition on short selling read more on short selling stocks here and here. Sykes mainly short sells penny stocks that are being hyped by promoters. These are often referred to pump and dumps. When a stock rises quickly, most likely from a stock promotion, Sykes will short sell the stock near its peak. The stock will ultimately crash and Sykes will cover the short for a nice profit. His strategy is proven time and time again as he has made millions using this trading strategy. Although, my trading style is different than Sykes (I trade momentum or breakout penny stocks on the long side) and I’ve been trading stocks a number of years prior to the Tim Sykes program came out, I decided to check out what Tim has to offer. For the review I decided to purchase a monthly subscription to Penny Stock Silver, which is the $99.95/month subscription plan. It includes access to the chatroom, a daily stock watchlist, real time trade alerts, and access to video lessons. Tim Alerts: This subscription plan cost $49.95/month. It gives you access to the chatroom, a daily 5-10 stock watchlist, real time trade alerts via profit.ly, email or text message. Penny Stocking Silver: This subscription plan cost $99.95/month. It includes all of the same features of Tim Alerts, but in addition you get weekly video lessons and access to the video lesson library which has over 1,400 video lessons. 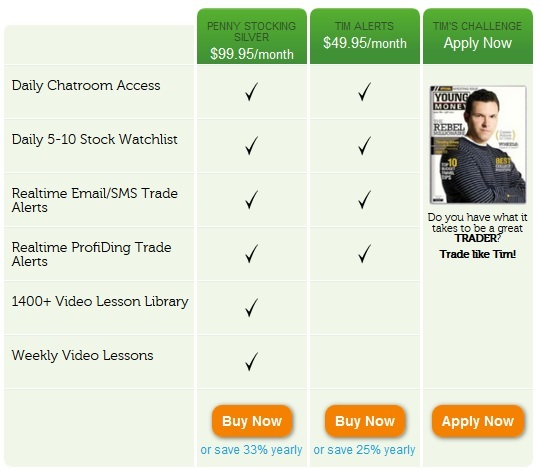 Tim’s Millionaire Trading Challenge: This is an educational program designed for new traders to learn to trade stocks. It is really less of a challenge and more of a course of study to learn his trading methods. The program covers many of the basics of trading stocks. It also goes in-depth and teaches Tim’s main strategy, which is shorting penny stock pump and dumps. It also gets into other strategies that he and his instructors teach, so students don’t have to rely only on trading penny stocks. Last I checked his educational program costs around $5000. It is a great course for the newbie trader or the struggling trader. Subscribers of both Penny Stocking Silver and Tim Alerts get access to the chatroom. This online chatroom typically has a daily presence of Timothy Sykes and has around 200 other people in it daily. Here you can get Tim’s real-time trade alerts, which is where Tim usually calls out his trades (buys or sells). The chatroom is moderated by Micheal Goode, who with Tim’s strategy has been able to surpass the 1 million mark in trading profits the past few years. There are also a couple other well-experienced traders in the chatroom that provide a variety of great insights. The chatroom is typically very focused on trading stocks, however during my month experience in the chatroom I noticed there were some people in the chatroom that would ask random and irrelevant questions, which was sometimes an annoyance. There also seems to be alot of copycat trading from subscribers that try to do the exact same thing that Tim is doing by trying to buy or sell the same stock. This can work fine a few times, but most of the time you will not get the same entry or exit price as Tim. Most don’t understand that Tim’s alerts are there for guidance, which is to give you examples of how he trades. So you should educate yourself before using this service that way you’re not just brainlessly following his alerts. But, overall the chatroom experience was good and I would recommend it to others to get a better insight on trading. Tim Sykes offers a handful of DVDs that can be purchased from the store on his website. I did watch some of his DVDs. The first few DVDs are geared more towards the newbie trader as the material in these go over more of basics of trading stocks. The next few DVDs he gets more in depth into his trading style of trading pump and dump penny stocks. And also gets into what type of setups and patterns he looks for. After watching his videos I was impressed. Tim does a great job in his teaching. His videos are very informative and he does a good job at motivating and entertaining you at the same time. Overall, I recommend his DVDs to newbie traders or for those looking to learn his trading style. Would I recommend Timothy Sykes? Yes. Some traders do have doubts about his strategy, however they have never tried out Sykes’s trading style. For me, after experimenting with his trading style I found that it worked very well. The only downside I found with short selling penny stocks is that it can sometimes be difficult to locate shares to short (especially when Tim’s followers are all trying to locate the same shares as well). And it could become more increasing difficult as more people implement this trading strategy. But, when I was able to find shares to short on some of the over-hyped pump and dump stocks I was able to profit nicely. Although my main trading is trading momentum or breakout penny stocks on the long side, I’ll still most likely continue to implement his trading style as I have found it a very effective and profitable trading style. Even though I have been trading for close to 10 years now, I still got alot out of Sykes’s educational videos. As a trader, I feel that education is important to help you continue to evolve as a trader. Overall, I think his program gets you a step in the right direction, but like anything else in life you need to study and work hard at it to learn the art of trading. His trading challenge program will give you a solid framework and fundamentals to trading stocks to help you develop your own trading strategy. While his style might not be for you, this is not the only strategy that Tim teaches. You can go on over to Profit.ly to learn other trading strategies from the other guru traders.